Shooting another Japanese short film, "3PM"
No, it's unlikely that I'll pull off what Tan Chui Mui did last year by making 7 short films in 7 months, but I'm trying to shoot at least one short film every 2-3 months. 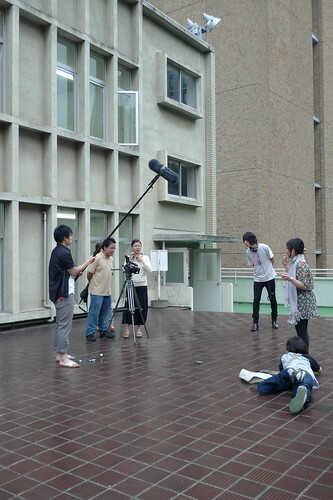 January I shot KINGYO (which you should know by now, is a Japanese production), April I shot AFTERNOON RIVER (Malaysian), and now, in June, I shoot my newest short film called 3PM at Waseda University. This is supposed to be coursework for the basic cinematography class I've been attending that's taught by Kenji Takama (director of photography for the DEATH NOTE films, WELCOME BACK, MR MCDONALD'S or SUMMER VACATION 1999, the latter I wrote about last month) We were divided into three groups and each of us given a simple 2-3 page long script to work upon. Of course, we were all given the creative freedom to expand upon the script however we want to. So I just decided to use this opportunity to shoot a new short film by completely revamping the script, and adding more than 7-8 pages to it. 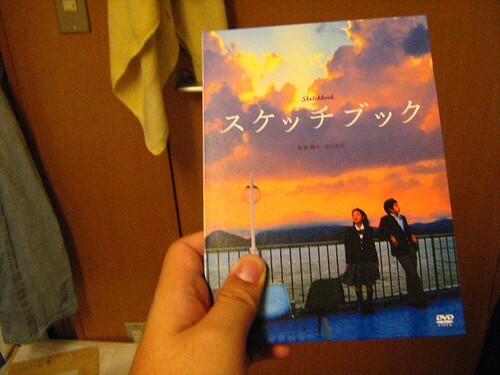 It's a light-hearted romantic comedy set in Waseda University. Being a zero-budget film, and having only a skeleton student crew, of course I don't have the privilege I had with Kingyo by hiring AND PAYING pro actors (.. and crew members) But then, this is a much simpler film in terms of logistics and scale. It's good to go back to basics. Yet because I had so little time for pre-production, I had some difficulties securing actresses. I was supposed to shoot the film last Friday, but we couldn't get anyone on Thursday, so I brought the entire group (which includes Yuichi the Producer-in-training, Erika the Cinematographer, Kabayama the assistant cameraman turned main actor, and Koh-san the sound dude) around the campus of Waseda University, asking attractive young women to act for us. Some actually said yes and gave us their email addresses. But in the end rationality prevailed, I sifted through my memory banks to find possibilities of actresses. I thought of a student film called Sketchbook I saw last year. And remembered one of its main actresses. I mentioned her. Erika the Cinematographer immediately said that the actress, Yumiko Kitazawa, is her friend. She made a phone call and asked for help. Yumiko said yes. 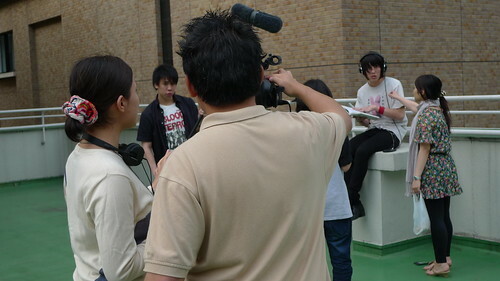 I met her the following day for some line-readings as the protagonist Mika. 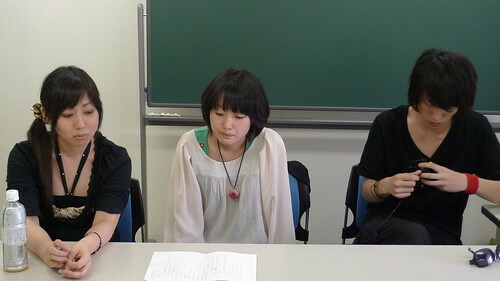 Kabayama, the supposed assistant cameraman is cursed with pretty boy looks, I relieved him of his crew duties so he could act for the film as Terada the love interest, which he accepted happily. Then I got lab mate An-chan, who was a production assistant for KINGYO, to take the role as Mako, the protagonist's best friend. Often before working with an actor or actress, I do my homework by studying their previous performances. In SKETCHBOOK she played a meek and introverted high school girl with long flowing hair. In this Youtube clip (she appears from the 0:06 to 0:15 mark) she looks very angstful too. I always want to give them a look different from their previous works. thus I decided to have her dress up like a guy, to increase more comedic value as a tomboy. The shoot finally started today. Last night and this morning, I was in a state of simmering anger because I can't believe that weather forecast said it was going to rain again. The raining season had started in Japan, and I realize that I had been fighting against the rain in 4 out of my 5 short films, including this one. LOVE SUICIDES was the only exception. Most of the time I incorporate the rain into the script, like I did with CHICKEN RICE MYSTERY and AFTERNOON RIVER, and often they make things much better. Then there was also KINGYO, where there was a rare winter rain I was forced to endure, and delayed the shoot for half a day. Thankfully the wet surface increased the beauty of the night sceneries. Rain, my eternal enemy, all the time I elude its grasp. I wonder what I had to do this time. Find a new place? Incorporate it into the script? Yet by the time the shoot began, the rain had yet to start. So I just shot the bloody film. After making three depressingly heavy films in a row, LOVE SUICIDES, KINGYO and AFTERNOON RIVER, I was relieved to do something comedic again. I even tossed in a climatic catfight scene. 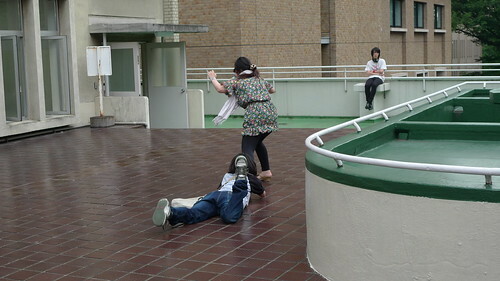 Poor Yumiko had to stay on the ground a lot. The joy about shooting comedies is that people usually have a lot of fun doing it. At the same time, I have to go through much more takes than usual because the cast members sometimes burst into laughter. Well, it WAS hard to keep a straight face when they were subjected to all kinds of crazy stuff I asked them to do. Despite numerous delays, filming ended at 5pm, just as planned. Just when I announced that we were done for the day, a few raindrops trickled upon me.